Over one billion people are infected with one or more of the 14 diseases defined by the World Health Organization (WHO) as neglected tropical diseases (NTDs). These are major parasitic, bacterial and viral infections that are the most common infections in the 2.7 billion people living on less than $2 a day.1 Those affected are often marginalized and forgotten by governments, left to suffer in silence. NTDs are diverse but all cause severe disability or death, and bring a major economic burden on endemic countries. Through extensive experience diagnosing and treating these 4 fatal NTDs in field programs, MSF has observed the continued neglect of these NTDs by governments, health professionals, and donors. These 4 diseases are largely under-resourced in control and treatment programs because they are considered too difficult and costly too treat; the available tools are limited; little investment has been made into research and development (R&D); and their disease burdens are poorly understood due to inadequate screening and surveillance systems. Nevertheless, the diseases are no less devastating for the individuals and countries affected. These barriers beg greater, not less, attention for effective responses to these diseases. Treatment is possible and saving lives today should be a top priority. The majority of people infected with Trypanosoma cruzi, the parasite which causes Chagas disease, show some sign or symptom at the time of infection. For many, the symptoms go unnoticed and for years these people live with the parasite without their health being affected. Nevertheless, in the chronic phase of the disease, 30 per cent will develop problems in their heart, gastrointestinal tract and brain which causes irreversible damage. Since it is impossible to predict who will develop the disease, treatment should be offered to all sufferers, with assessment of their clinical status and age. As the disease often does not present symptoms, active detection of cases should be a priority in programs to combat Chagas. Diagnosis currently requires confirmation through laboratory tests. In many cases, the endemic countries do not have the necessary facilities or staff available to carry out these tests. It is essential that communities living in endemic zones have access to diagnosis and can find out if they have been infected with T. cruzi. If not, thousands of people will die each year without knowing the cause. Currently, there are only two medicines to combat Chagas disease: benznidazole and nifurtimox. Both were developed over 35 years ago in investigations not specifically aimed at Chagas disease. Presently, neither of these drugs is adapted for paediatric use and cannot be used by pregnant women. The success rate reaches almost 100 per cent in newborns and infants. However, for older children, adolescents and adults this treatment is at best 60 or 70 per cent effective and can have multiple side effects, and therefore has to be taken under medical supervision. Until a few years ago it was thought that the treatment was only effective in very young children and not in adults. However, recent studies demonstrate that it is possible to treat adults, even after the heart or the gastrointestinal tract are mildly affected (initial clinical forms of the chronic phase). As the side effects of the treatment are more common in older patients, doctors have been reluctant to administer the medicine out of fear of the consequences. We now know through our experience that the adverse effects are manageable. HAT comes in two forms: Trypanosoma brucei (T. b.) gambiense (West African) and T. b. rhodesiense (East African). The most widespread form is the T. b. gambiense, which has a long period before becoming symptomatic. The sickness occurs in two stages. Symptoms begin with fever, headaches, and joint pains. Stage 2, the neurologic phase, occurs when the parasite crosses the blood-brain barrier and infects the central nervous system. The patient can suffer from confusion and reduced coordination; then the sleep cycle is disturbed, which leads to bouts of fatigue punctuated with manic periods. The sickness progresses to daytime slumber, night-time insomnia, and mental deterioration, and finally leads to coma. Without treatment, the disease is 100% fatal. Even if treated, the damage caused in the neurological phase can be irreversible. Currently the diagnosis and staging of the disease requires a complicated series of painful tests (e.g. lumbar puncture) and the treatment is long, toxic or difficult. Both necessitate trained medical supervision and are furthermore difficult to administer in remote areas where the disease occurs. There is an immediate need to improve current diagnostic and treatment options, particularly for patients in the advanced stages of this disease. Current diagnostics are difficult and require a lumbar puncture to confirm the stage of the disease. Available treatments are few, dated and stage-specific. Stage 1 treatments, pentamadine (dating from 1941) and suramin (dating from 1921), are fairly well-tolerated but require injections. They do not, however, pass the blood brain barrier and are thus ineffective for the treatment of advanced (stage 2) HAT. Melarsoprol (dating from 1949): An arsenic derivative, highly toxic, rising rates of treatment failure, but in 2008 still half of stage 2 HAT patients received it. The treatment is painful, long with 10 days of intravenous injections. It is increasingly ineffective with up to 50% treatment failure in some areas, and kills 5% of those who receive it. Eflornithine (dating from 1990): Relatively well tolerated, efficacious, but resource-intensive and difficult to administer. It requires trained health staff and constant hospitalisation and care with 56 intravenous (IV) infusions over a period of 14 days. The potential for resistance, when used in monotherapy, is an increasing concern. NECT (nifurtimox-eflornithine combination therapy): In May 2009, WHO added NECT to the Essential Medicines List (EML) for the treatment of stage 2 HAT. 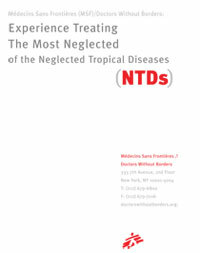 NECT was developed by Médecins Sans Frontières (MSF), Epicentre, DNDi and its partners like the Swiss Tropical Institute (STI), with the support of the HAT Platform (platform of partners who develop research capacity in countries where HAT is endemic) including national HAT control programs of most affected countries. NECT is a simplified combination treatment of IV eflornithine with oral nifurtimox. This improved treatment is a step in the right direction, reducing current eflornithine treatment from 56 infusions over 2 weeks, to 14 infusions over 7 days, with oral tablets 3 times a day for 10 days. For over two decades, since 1986, MSF has been a leading organization working in the diagnosis and treatment of HAT, particularly in war-torn areas, screening more than 2.6 million people and treating more than 48,000 cases of HAT in 6 countries6 (Uganda, Southern Sudan, Central African Republic, Republic of Congo, Democratic Republic of Congo and Angola). Current projects include Central African Republic, Democratic Republic of Congo, Uganda, and Chad, and an assessment is underway in South Sudan. Visceral leishmaniasis (VL), also known as kala azar, is a worldwide protozoal vector-borne disease, endemic in 47 countries and putting approximately 200 million people at risk of infection. The annual incidence is estimated to be 500,000 cases, with 90% occurring in India, Bangladesh, Nepal, Sudan, and Brazil, (and 60% in the Indian subcontinent alone).7 The disease often affects the poorest populations. This is the second largest cause of parasitic death, characterized by fever, weight loss, hepatosplenomegaly, anemia and a depression of the immune system. Without treatment, nearly all patients will die. Death can be avoided by timely treatment, even in basic field circumstances. Epidemics associated with high mortality are frequent where conditions such as complex emergencies, mass migration, high rates of HIV and poor nutritional status accelerate the development and spread of the disease, and where many patients do not have access to treatment. The recent (end 2009) outbreak in South Sudan involved ~1,000 patients, and is considered the start of a much larger re-emerging epidemic in the region. A major challenge is co-infection of VL and HIV. Both diseases influence each other in a vicious spiral: HIV patients are much more susceptible to develop VL, and once infected, VL accelerates the onset of full blown AIDS. Different species of the Leishmania parasite causing the disease are transmitted by the phlebotomine sandfly. Both animals and humans can act as the parasites reservoir. Post kala azar dermal leishmaniasis (PKDL) appears as a rash that occurs after or during VL infection and treatment. It can be highly infectious as parasites may be present in the raised areas of the skin, acting as a reservoir for anthroponotic VL (ie transmission by sandfly bite from PKDL patient to new patient) between epidemic cycles. Initially screening relies on history of prolonged fever and clinical splenomegaly. Clinical suspect patients can be investigated for VL using rK39 antigen-based rapid diagnostic test (RDT). RDTs only require a drop of the patient’s blood. In suspect cases with negative RDT result, VL can be either ruled out (in areas where rK39 RDT have proved to be highly sensitive) or further searched by another serological test (e.g. the DAT) or by microscopic examination of spleen, bone marrow or lymph node aspirates. These techniques require technical expertise and laboratories that are often not available in areas where most patients are. ELISA and IFAT tests have been developed for the diagnosis of VL, however their use is limited in the field as a well-equipped laboratory and skilled personnel are required. Current treatment options include pentavalent antimonials (Pentostam®, generic SSG, Glucantime®), amphotericin B deoxycholate, liposomal amphotericin B (AmBisome®), paromomycin and miltefosine. Combination therapies will be available in the near future. Although the list of treatment options seems extensive, each has significant limitations. Pentavalent antimonials, given as daily intramuscular injection for 30 days, is used as first line therapy in most countries. It is still effective in most endemic areas. However, there is a 60% failure rate to this medication in Bihar State, India. It can cause serious toxic side effects, and is poorly tolerated in elderly, moribund, pregnant ans HIV co-infected patients, with mortaility being significantly higher than in non HIV-infected. Miltefosine is contra-indicated during pregnancy, and should ideally be taken in combination in order to avoid the development of drug resistance. The treatment in monotherapy is 28 days so adherence to non-directly observed treatment is another barrier and can also contribute to drug resistance. Paromomycin is administered intramuscularly for 21 days, which may trigger lack of adherence. This is the cheapest available drug. While its efficacy is high in India, it is less in East Africa where higher dosage or use in combination will be required. Amphotericin-B deoxycholate is a cumbersome treatment that needs to be given in slow IV infusions daily or every other days for 14 doses. Careful hydration and potassium intake are needed to avoid renal toxicity and hypokalemia. AmBisome® is used as second line therapy for patients in East Africa, once SSG fails. In India, given the high levels of resistance to antimonials, it is the best first line therapy option on a regimen of 20 mg/kg b.w. divided over 5 infusions with an excellent tolerability, safety and efficacy. It can be used in pregnant women. However, its current cost remains an important barrier to treatment. The treatment landscape is evolving, and treatment regimens are being simplified. Studies showing efficacy and safety of AmBisome® at a reduced dose (single shot 10 mg/ kg. B.w.) on the Indian sub-continent are promising. Results of combination treatment studies are also anticipated, with the intent to (1) reduce the risk of the parasite developing resistance to the drugs, (2) optimize the efficacy and safety of treatment, and (3) reduce costs and hospitalization time. Since 1988, MSF has treated more than 85,0008 VL patients in Sudan, Ethiopia, Kenya, Somalia, Uganda, Nepal and India. MSF has validated and introduced rapid diagnostic test (rK39 antigen-based dipsticks), that can be used in remote settings. The ease and convenience of this test has allowed decentralisation of diagnostic and sometimes treatment services to remote areas, where laboratories cannot be established, and thus has improved access to care in endemic areas such as Sudan and India. Bihar State, one of the poorest states in India and the world, is where MSF has been treating patients with iposomal Amphotericin B (AmBisome®). From July 2007 to mid-2009, MSF has treated 3,167 patients in Bihar State, India, with very promising results in terms of both efficacy and safety.9 The results of this project have shown that treatment infused at 20mg/ Kg (total dose) in 5 injections given over a period of 10 days (in contrast with the longer treatment regimen needed with conventional amphotericin-B) is very successful in both hospital and primary health care settings. In Ethiopia, where more than 30% of the VL patients are HIV infected, VL and HIV care are closely integrated. A major challenge in the management of HIV/VL co-infected patients is the high toxicity and poor tolerability to antimonials, and the poor effectiveness of AmBisome® (even in high doses) in these patients. VL cannot be permanently cured in HIV infected patients, and will inevitably result in repeated relapse, even if patients are on anti-retroviral treatment (ART). Buruli ulcer, a disease caused by infection with Mycobacterium ulcerans, is one of the most neglected but treatable tropical diseases. The causative organism is from the family of bacteria that causes tuberculosis and leprosy, but Buruli ulcer has received less attention than these diseases. Buruli ulcer has been reported in over 30 countries mainly with tropical and subtropical climates including in Africa, Australia, the Americas, Asia and the Western Pacific, but it may also occur in some countries where it has not yet been recognized. The exact magnitude of the problem is not known, but some areas may have high prevalenceii. Limited knowledge of the disease, its focal distribution and the fact that it affects mainly poor rural communities contribute to low reporting of cases. It frequently occurs near slow-flowing water bodies, ponds, swamps and lakes. All ages and sexes are affected, but most patients are under 15 years of age. The disease can affect any part of the body, but in about 90% of cases the lesions are on the limbs, with nearly 60% of all lesions on the lower limbs. This chronic disease often leads to massive destruction of the skin, often followed by debilitating deformities. Buruli ulcer is associated with nonspecific clinical manifestations and has a slow course, with a resultant delay by those affected in seeking care until there is massive skin necrosis requiring extensive surgery and prolonged hospitalization. The mode of transmission of the disease is not known, and this currently makes primary prevention strategies nearly impossible. The exact mode of transmission is unknown and still under investigation; some patients state that lesions develop at the site of antecedent trauma, and some research suggests that in Africa some aquatic insects can harbor M. ulcerans in their salivary glands. More recent studies from Australia and Cameroon suggest that a type of mosquito may be a vector; if confirmed, Buruli ulcer will be the only known mycobacterial disease to be transmitted by insects. Although the recommendation is to make a confirmed diagnosis before treatment, it is commonly the case that Buruli ulcer is diagnosed and treated based mainly on clinical findings by experienced health workers in endemic areas. Laboratory diagnoses are infrequently used to make decisions about treatment because of a lack of tools together with logistic and operational difficulties. However, laboratory diagnoses can be used to confirm the clinical diagnosis retrospectively on swabs and tissues taken during treatment, but this is seldom done. The current recommendations for treatment are as follows: A combination of rifampicin and streptomycin/amikacin for 8 weeks as a first-line treatment for all forms of the active disease. A combination of rifampicin and clarithromycine can be used if there are contraindications. Nodules or uncomplicated cases can be treated without hospitalization. Wound care and physiotherapy (to prevent deformities) are crucial components of care. Surgery is often needed to remove necrotic tissue, cover skin defects and correct deformities. If the patient show signs of complications or is referred at the very late stage of the disease, this may need to be treated by amputation. Early diagnosis can simplify the surgical management and reduce the likelihood of deformities or the need for amputations. These most-neglected NTDs have been under-prioritized, under-funded, and overlooked for too long. The cost of this neglect is tremendous for the families, communities, and countries affected. While many challenges exist, MSF experience treating these 4 NTDs has demonstrated that a response is feasible, and patients can be treated. Increased access to existing treatment: There is a lack of access to existing treatments, which are not always readily available or even known to physicians. Patients are suffering and need to be treated now with available medications, and access to these medications is essential. This includes ensuring that treatment guidelines are updated and that all treatment options are registered in endemic countries. Lowering existing drug prices: The high cost of patented drugs has been a barrier for affordable treatment access for drugs for neglected diseases, including liposomal Amphotericin B (AmBisome®) and sodium stibogluconate (SSG) for VL that are priced out of reach of poor countries. For example, in the MSF program in Bihar, India, the treatment cost of AmBisome® is US$450 per patient, but this price can climb to $2,500 per patient, which is too expensive for most government Ministries of Health. Better data collection and robust surveillance mechanisms: The burden of these NTDs is significantly underestimated in official statistics. Systemizing data collection on these diseases to establish incidence and prevalence is necessary to calculate the real requirements for medicines and laboratory reagents, to in turn ensure the availability of diagnosis and treatment supplies. Ongoing efforts are needed for robust surveillance and response mechanisms necessary to diagnose and treat NTDs in areas where it poses a serious public health threat. This can be achieved by creating systems that are more reactive and use active screening and notification systems. New diagnostics are desperately needed: Simple, rapid, and affordable diagnostic tools are required to make diagnosis of patients in the field accessible. In the case of Chagas disease, a test for cure is urgently required to be able to confirm success of treatment for the patient, and is essential in measuring efficacy of new drugs. This requires long-term investment and commitment to be made by laboratories, investigators and funders. Urgent need for new treatments: While current treatments should be used to treat patients now, they are far from ideal. New, safer, more effective, affordable treatments are needed that can be used in remote and resource-poor settings. In the case of HAT, while the development of NECT is a huge advancement, more research and investment are urgently needed to develop a new treatment that requires no injection, is affordable, is effective in both stages of the disease, and is easy to use in remote, primary health posts close to the patients. Increased and sustainable investment in R&D: In 2008, R&D spending for these four NTDs totaled as low as $81 million according to a recent analysis, with most of the funding going to basic science and not R&D of new drugs and diagnostic tools.10 Negligible funding has been provided nationally or internationally for diagnosis and treatment programs. New and better tools can meaningfully impact the global burden of NTDs. Increased investment and support of new R&D incentives and funding mechanisms are needed and existing mechanisms need to encompass the most neglected NTDs. Raising awareness: Patients, healthcare professionals and governments need to be made aware of these disease, their prevalence, available treatments, and the need for increased R&D. Human African Trypanosomaisis - Fact Sheet - MSF 2009. WHO/ “THE LEISHMANIASES AND LEISHMANIA/HIV CO-INFECTIONS” /Fact Sheet N° 116 . Revised May 2000. MSF/ International Symposium “Advances in Visceral Leishmaniasis therapy”. Fundación Areces, Madrid, 19th June 2009.